Caption slip reads: "Photographer: Swaim. Date: 1961-11-08. Reporter: Swaim. Assignment: Rose Parade. 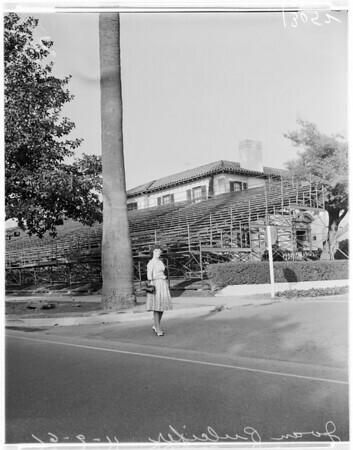 25/26/34: Joan Pulcifer, stenographer at Tournament of Rosses Assn, walks to work past Rose Parade grandstands already erected on South Orange Grove Blvd. Grandstand is built on the lawn of one of old 'millionaire's row' mansions, partly showing in background".